Why is the R/V Knorr going to the Equator? Way back in the early 1800s, Gaspard Gustave de Coriolis, a French engineer and mathematician figured out that the Earth's rotation on its axis had a strong influence on the motion of fluids, both gases and liquids. This influence is greatest at the poles and becomes minimal at the equator. This causes fluids in the Northern Hemisphere to be deflected to the right. In the Southern Hemisphere, fluids are deflected to the left. Gyres on either side of the equator move in opposite directions: clockwise in the north, counterclockwise in the south. At the equator, where the Coriolis Effect is very small, air and water move from east to west and is deflected poleward. This causes the fluid to move upward. In the atmosphere, equatorial air is heated as well. Heated air moving toward the poles rises. As it does, it cools and the water vapor it contains condenses and clouds form. More clouds means more precipitation and the equator is know for plenty of rain and cloudy days are not uncommon. The clouds today were fantastic. You could see all three levels: cirro- (high), alto- (middle), and strato- (low). There were cirrus, altostratus, cumulus and cumulonimbus. We sailed in and out of cumulonimbus clouds. It rained off and on all day. Seawater at the equator behaves similar to air. As the water moves from east to west, it is deflected toward the poles. This causes upwelling, which is extremely important to anything living in the sea. As on land, the major source of energy for marine life is sunlight. The photosynthetic organisms live in the photic zone, the zone where light penetrates. At the equator, there is plenty of light energy but the photosynthetic organisms use up the available nutrients: phosphorus, nitrogen and silica. The lack of nutrients is the limiting factor to life in the photic zone. Upwelling brings nutrients to the surface and supports a much richer community. More photosynthesizing organisms support more consumers at all levels. The maps show our track across the eastern Pacific. 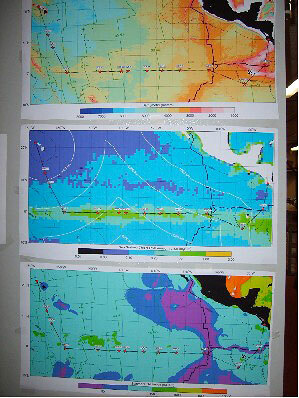 The top map shows ocean floor topography. The middle map shows chlorophyll production. The bottom map show sediment thickness. Eventually all these critters die and fall to the seafloor. This increases the amount of sediment and the production of nutrients from the decay of these organisms supports other critters living in the sediments. Because of the Coriolis Effect, the Equatorial Pacific is a place on Earth where biological production is high a very long way from any land. Whew! .... And that is why we are here... to understand how distance from land and the amount of organic decay products in the sediments might effect the biological productivity in the seafloor sediments. My sources for this information include Rick Murray and Rob Pockalny, scientists on board the R/V Knorr during this expedition. Which direction do gyres in the Northern Hemisphere and in the Southern Hemisphere cycle? What causes air to rise at the equators? What is upwelling and why is it so important to marine life? How does an increase in the number of organisms affect the amount of sediment on the seafloor?